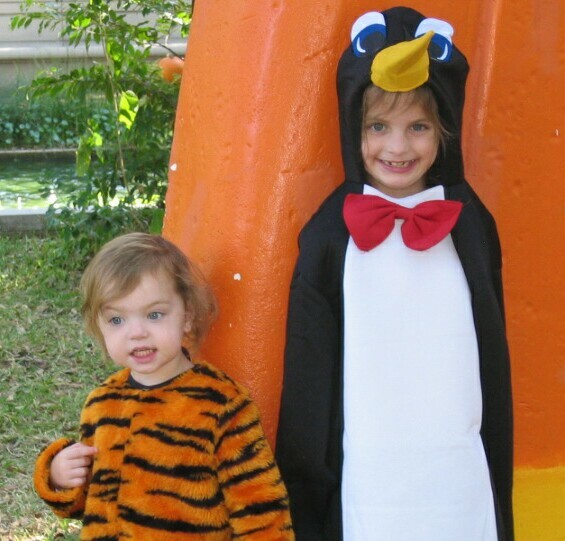 Took a little time off to have Halloween with grandaughters Hannah and Madeline in Houston. If you’re a kid in America what a great holiday Halloween is. Basically, strangers give you candy for dressing up and pretending to be someone or something your not. Hummmâ? ?¦come to think of it, this is a bit like politics where politicians pretend to be something their usually not (honorable, honest, concerned ) when really all their after is the candy. When it comes to trick-or-treat we are usually the ones who are tricked. Well that’s a discussion for another day. Hannah (6) and Madeline (2) certainly had a great time as you can see below. The true 3D aficionado has been waiting for the first true commercial product announcement. We already have face to face stacking without TSV (chip-on-chip in the Sony Playstation and many other products) and TSV being used for 1 layer image sensors (nearly all of todays CMOS image sensor manufacturers) but when will we see a true 3D design which will contain (a) TSV, (b) stacking and (c) thinning ? We were teased this past week with headlines such as “Xilinx Stacked Silicon Interconnect Extends FPGA Technology to Deliver ‘More than Moore’ Density, Bandwidth and Power Efficiency”. I must acknowledge that it does not directly say anything about 3D, but there certainly was a lot of buzz in the industry since the packages make use of TSV interposers. We have seen a lot of structures recently that use the silicon interposer to mate die to the top and bottom of the interposer (i.e the Renesas SMAFTI) . Last week Xilinx announced a single layer, multi chip silicon interposer for its 28nm 7 series FPGAs. These FPGAs reportedly extend the range of applications programmable logic can address by offering up to 2 million logic cells for high levels of computational performance and high bandwidth. The 28nm Virtex-7 LX2000Tmulti die FPGA will provide more than 3.5X the logic for capacity of the largest current-generation Xilinx 40nm FPGA with serial transceivers and 2.8X the logic capacity of the largest competing 28nm FPGA with serial transceivers. Xilinx reports that they have been working with TSMC and their assembly house Amkor. The device is made possible by Amkors micro-bump assembly, FPGA architectural innovations from Xilinx, and advanced technology from TSMC. The new products deliver lower levels of power consumption, system cost and circuit board complexity compared to using multiple FPGAs, each in their own package, for the same application. 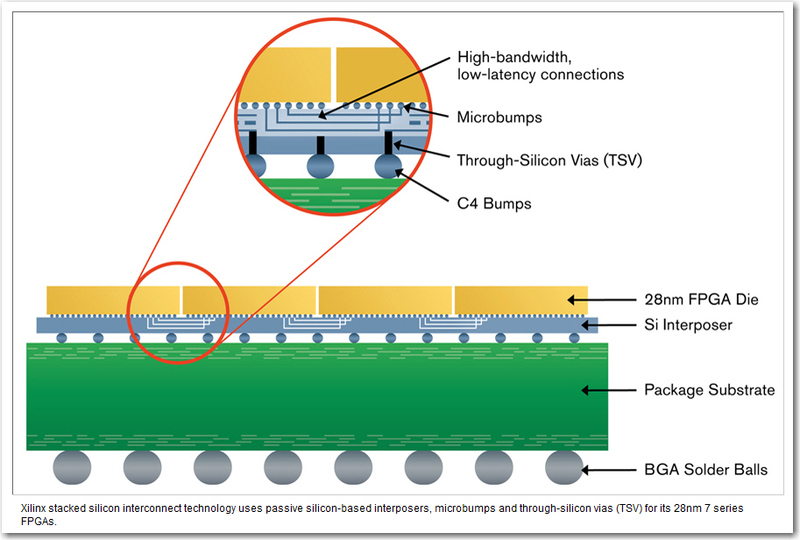 By using TSV silicon interposer to implement their stacked silicon interconnect approach, Xilinx reported that they “ reduced the risk involved with thermal and design issues of full 3D IC stacking” This probably means that full 3D just is not ready yet and we will be seeing more ”Xilinx like” designs in the near future before we see full 3D in a few years from now. According to Xilinx, Initial devices will be available in H2 2011. For more technical information including white papers, visit the Xilinx web page at: http://www.xilinx.com/stackedsilicon. I was personally told that full technical details are being withheld till the next ECTC conference [ June 2011]. Last week Amkor did release come details on their technology. 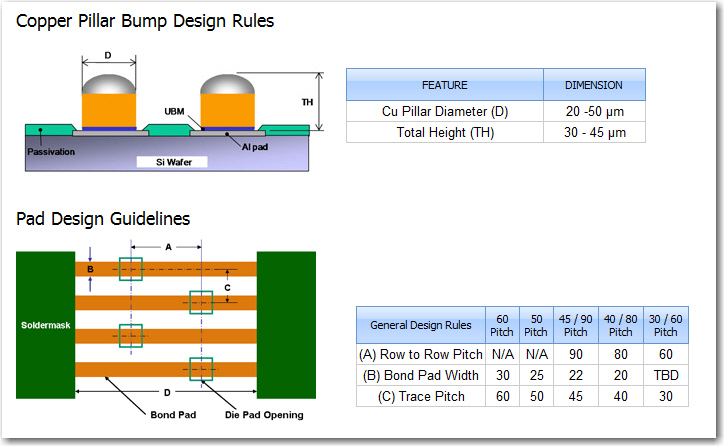 For all the available information on this technology see the amkor website here (AMKOR) .Design rules are shown below. The Weibul plot shown below shows an improvement in life for Copper Cu pillar over SnAg bump for the same current / temperature condition and similar bump / UBM geometry. 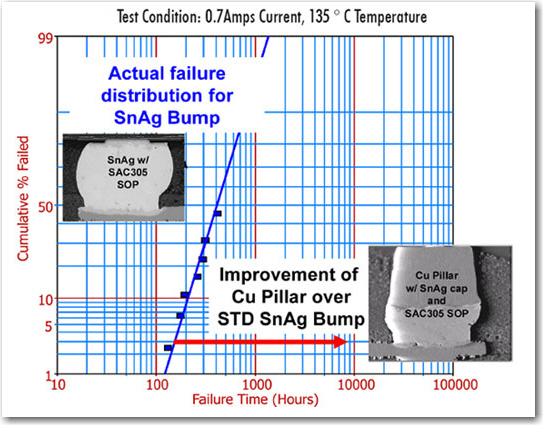 No failure was observed in Cu Pillar Bump even after 8000 hours of testing at the same condition. Intel Becoming a Foundry ?? Intel has agreed to manufacture a specialized microprocessor design for Achronix Semiconductor at its most advanced factory [link]. While the production use less than 1% of Intels production capacity, it certainly is a departure from their normal business model and may point to their experimenting in the foundry business to keep such options open for the future. While Intel is brushing this off as non important, I would kep an eye out for similar developments. For all the latest in 3D IC and advanced packaging stay linked to Insights From the Leading Edgeâ? ?¦.